BlackBerry's latest is the Passport, a 1:1 aspect ratio smartphone built for business and designed to drag the ailing Canadian firm back to the fore. The gigantic handset touts a square touchscreen display, although long-time BBers will be pleased to see a physical QWERTY keyboard also in tow. The phone's design is inspired by its namesake, with BlackBerry arguing that actual passports are the 'universal symbol of mobility'. 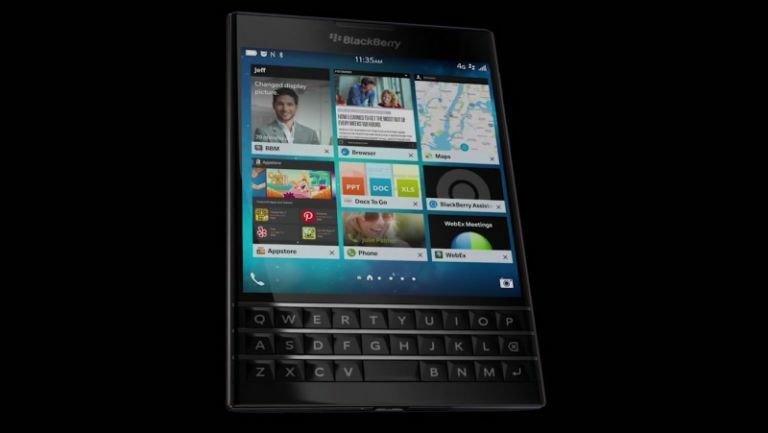 "As we set out to design BlackBerry Passport, we were guided yb a simple yet challenging idea - to set aside the limitations of traditional design and to instead simply build a device that fundamentally changes the way business professionals get work done on their smartphone" says John Chen, Blackberry's CEO. The Passport is at least partly a breakaway from traditional smartphone design, and thus it appears almost refreshing, despite being assured to turn a lot of consumers off. BlackBerry's remained staunchly clear about its targeting of enterprise with this phone - the Passport is much more suited to board-room than bedroom. The screen measures in at a respectable 1440 x 1440 resolution across 4.5-inches - that puts it at a very dazzling density of 453dpi. Processing heft is offered up by a 2.2GHz quad-core CPU, with 3 gigs of RAM and 32GB of storage also making an appearance. There's a sizeable rear-snapper on board, measuring up at 13MP, as well as touting optical image stabilisation for blur-binning photos. The device will ship with BlackBerry's 10.3 operating system, which will offer spanking new features like BlackBerry Assistant, BlackBerry Blend, and the Amazon Appstore. BlackBerry Assistant is the Canadian smartphone maker's answer to Siri and Cortana, and will intelligently respond to in either text or speech, depending on how you choose to interact with it. Juice comes courtesy of a 3450mAh, which should keep the handset ticking for 30 hours of mixed use if BlackBerry is to be believed. Want a black and gold BlackBerry Passport? Better be quick!